Unused Longshot #1 cover by Arthur Adams. Longshot ©2002 Marvel Characters, Inc. Art ©2002 Arthur Adams. Let's face it: Arthur Adams, since blasting onto the comics scene like a neutron bomb with his limited series Longshot back in the 1980s, is a creator of enormously fun comics. From that refreshing debut to his memorable three-issue run on the Fantastic Four (#347-349) to his creator-owned Monkeyman and O'Brien to his present-day (and some say personal best) work on "Jonni Future" in Tom Strong's Terrific Tales (not to mention Ye Ed's fave AA work, The Creature from the Black Lagoon), Arthur's artistry remains eminently entertaining and pleasing to the eye. 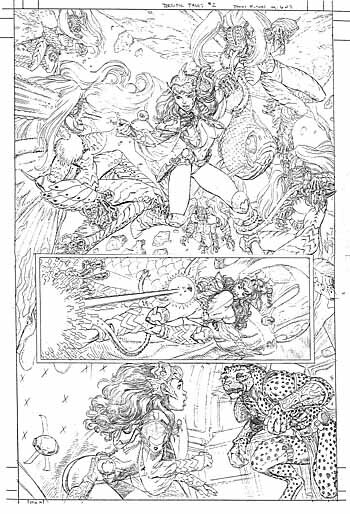 But few Arthur Adams interviews seem to exist, so we cover pretty much his entire career in the following three-hour interview, which took place via telephone on November 15, 2001, and was copyedited by the artist. Special thanks to John Fanucchi for his spectacular and herculean assistance in gathering and contributing art for this feature. Special kudos also to Joyce Chin. Comic Book Artist: Where are you from, Arthur? Arthur Adams: We're not going to film out of sequence? [laughs] Where am I from? That's hard to remember; after all, I was very young when I was born. That's complicated. I was born in Holyoke, Massachusetts, many, many years ago. My dad was in the Air Force, so we actually moved around quite a bit until I was about five years old, when we moved to a little town called Vacaville outside Travis Air Force Base in California. My dad found some way to keep us stationed there was the rest of his 20-year Air Force career. It's just 50 miles from here where I am right now, in San Francisco, California. CBA: You were born in 1963? CBA: You're probably the youngest guy I've ever interviewed for the magazine! [laughter] Younger than me! CBA: Bruce is one of the few exclusively contemporary guys I've interviewed [in Comic Book Artist Special Edition #1]. He was born around 1961, I believe. CBA: Hey, I'm almost 43, so watch it, dude! [laughs] Did you get into comics at a young age? CBA: Had that holly wreath on the cover? Arthur: Yeah! I think it was a Buscema cover, maybe inked by Romita. But yeah, it's a bunch of the super-heroes running forward, and then on the back cover, it's them running away. It also had a real nice Gene Colan/Bill Everett Black Widow story, and my favorite was the two-parter Fantastic Four and the Avengers versus the Hulk! CBA: By Stan Lee & Jack Kirby! Was this your first real exposure to super-heroes? Arthur: The first time I really noticed. I'm sure I must've seen them before, but this was the first one I really got jazzed about. I'm sure I'd seen all those old Marvel cartoons... I must've seen some comics, because my mom once a month would go to the thrift shop and come back with a hay-bale of comics, a big pile wrapped in twine. About half of them would be romance and war comics, and those would get tossed aside, and the other half would be super-hero and monster comics. Arthur: Yeah! It was the stuff I liked. I now wish I'd kept some of those war and romance comics, those would've been pretty interesting to see now. The stock Arthur Adams iconic image of Wolverine, Marvel's most popular character, reproduced on a zillion items, from T-shirts to cans of Chef Boyardee. ©2002 Marvel Characters, Inc.
CBA: Did you start drawing at a young age? Arthur: Oh, I've always drawn. I don't remember ever not drawing. My mom has some drawings around the house-don't ask to see those!-and I drew everything! Mostly I drew dinosaurs, King Kong and monsters. I was crazy for all those monster movies, the Creature Features every Saturday. CBA: Did you draw your own comics as a kid? CBA: When did the idea of comics as a vocation come to mind? Arthur: You know, I haven't thought about that for a while, but the first time I thought about comics as something I wanted to do was when I bought and read the very first issue of Micronauts, by Michael Golden and Joe Rubinstein, written by Bill Mantlo. So when I saw it, I bought lots of copies of that one and was giving them to everyone I knew in high school, and they were looking at me like I was insane, and I'd say, "Look, that's what I'm going to do!" CBA: [laughs] You immediately clued into Mike Golden's abilities? Arthur: Somehow, it just leapt off the page at me. I'm not even sure why, because I've looked at the first issue since then, and while there's neat things about it, his drawing style changed so radically around issue #5 or 6 and I liked that stuff much better. It's really strange to look at #1 and then the last issue he did, because they're completely different! CBA: Was he the first artist you really admired? Arthur: He's the first one I really noticed. I don't know if I'd really seen too much of Bernie Wrightson at that point. That would've been in 1978, '79. CBA: He was working on Frankenstein, I think. Arthur: Yes, that's right, portfolios and stuff like that, so I wasn't really aware of that material, and we didn't have any comic book shops where I was living. I'd go to the Air Force base commissary and it was tough to find my comics. They had pretty much standard comics. After Golden, then I started looking more at other artists. CBA: As you were getting an interest in comics again, the direct sales market was just starting. CBA: Did you get into the Star Wars stuff? Arthur: A little bit. You know, I was never that crazy about Star Wars. I liked the first movie-that's the one you're supposed to like, right? [laughs]-and I had some of the toys, but I don't think I went nuts on the Star Wars stuff. I was always more interested in model kits. I got all the model kits of the Star Wars and Star Trek I could find, all the Aurora monster models and stuff like that. CBA: Did you start developing an interest in retro, older material at all? Or was it pretty much the contemporary scene? CBA: We have to be slightly reverent now, right, because it's got the World Trade Center twin towers in it. Arthur: That's not enough, it's a terrible movie! [laughter] It doesn't even compare to the original King Kong! CBA: Well... It does have Jessica Lange in it. Arthur: Yeah... but that's not enough, either! When my wife and I first started going out, she came over to my place, and I sat her down and said, "You've got to watch these!" and I had her watch both Frankenstein and Dracula, and she watched them, and when they were done, she went, "Well, that was weird. There's no music in those!" That had never occurred to me! There's almost no music in those movies! She said, "They're dull, and there's no music!" It was really hard to put music on the talkies in the early days, I guess. Arthur: That was it! That got me going, and then I started looking at comics all over the place, and I was keeping an eye out for Golden's stuff, and right around that time Bill Sienkiewicz started working on "Moon Knight" in the back of The Hulk magazine. I thought that stuff was pretty cool. I also really got into Walt Simonson's stuff. He had done some Rampaging Hulk stuff I liked. He'd done one fill-in issue of Star Wars that I really loved, then he penciled and inked-and I think maybe wrote-one issue of Battlestar Galactica I thought was the greatest. His X-Men/Teen Titans was like the bible of how to draw comics for me. I wore out I don't know how many copies looking through that thing! CBA: When you learned more about Walter, were you surprised to find parallels in your respective lives? He studied paleontology. Arthur: [laughs] Walt's a much smarter guy than I am! [laughter] He's actually done some stuff! He went to college! I've only thought being a scientist, "Hey, that would be cool! Nah, I'd have to go outside!" CBA: Did you become friends? Arthur: Yeah, I like Walt a lot! We don't talk as often as we should, I'm notorious for not calling anybody, but Walt and I have gone through periods where we were talking every day, then we'd go through periods where we'd talk about every six months, but every time, it's like we talked just the day before. I love Walt and Weezie, they're great. CBA: Did you see him as your biggest influence for a period? CBA: You were buying the old comics? Arthur: When I could, I was finding old stuff as time went by, yeah, I was learning more about things, so I started picking up Swamp Thing reprints, early on. When I was 18 or 20, A Look Back came out, and I picked that up at a convention, and somehow I worked up the nerve to spend as much as $40 on a book! CBA: [laughs] Now probably valued at $250! Arthur: Yeah, I know! I'm not selling my copy! [laughter] Actually, mine's pretty messed up by now. Before I started going to conventions, I was doing drawings for people at school to get money to buy comics. I had a couple of the Frazetta books, and I'd get Xeroxes of the black-&-white drawings, and I'd paint them... I didn't know what I was doing with any of the stuff! I wanted it to look like the oil paintings, but I had no idea how to do that, so I was just using watercolor, putting it on as thick as possible! [laughs] If you bent the pages, the paint would just crack off! [laughter] I ended up using it in really odd ways, but I would sell those for a couple of bucks to kids at lunchtime, and I'd take that money to buy comics. Then, I started going to conventions when I was about 17, and I met Bob Shreck at a Creation Convention, and asked if I could set up at a table, too. I had brought my portfolio and showed it to him, and he said, "Sure! Grab a table!" There was this one particular girl out here who just wanted drawings of Harrison Ford as an elf. Fortunately, I don't think I have any copies of those! [laughter] Somehow, I'd go to the conventions and do things for like five or ten bucks or so. Then I started buying that old stuff! The old "New" X-Men, featuring the shortlived member, Thunderbird, in this Arthur Adams pin-up. ©2002 Marvel Characters, Inc.
CBA: What was in your portfolio? Arthur: Crap! It was just lots of pin-up stuff. There was nothing! CBA: There was no attempt at continuity? Arthur: By the time I starting going to conventions, there was a little bit of continuity. Early on, I'd done one monster comic for myself, but it was all splash pages-50 pages of splashes!-so I hadn't really tried much continuity. When I was around 17, I started trying to draw, I did a Wolverine story. Everyone else did, why shouldn't I? CBA: Were you into X-Men? Arthur: I knew X-Men was popular, but I was not into it that much. Which is actually pretty funny because I became so associated with X-Men for a while. I thought Chris did a great job on it, though I was never that crazy about the John Byrne stuff. CBA: Do people naturally assume he's an influence on you? Arthur: No, I'm just talking about when the book was really popular, and people were telling me, "You've got to check out this X-Men stuff!" I'd look at it, and I really liked the story, the whole Phoenix story towards the end, but I liked it as a writer/artist package! I could recognize it was a good comic book. The writing and the art were balanced. You couldn't really have one without the other, and I really liked those, but artistically, Byrne was never really an influence. CBA: I'm a little surprised, because there's that element of whimsy in your work, as well as in his. Arthur: I think what might be the aspect I really liked about X-Men artistically was Terry Austin. He inked Tom Sutton, I think, on some Alice Cooper Marvel Premiere, and Terry had just gone nuts on it! He put Popeye in the background, graffiti on the walls... [laughter] Just really odd things everywhere! I loved that stuff. Somehow, Terry was more of an influence, I think, than John was on my stuff. CBA: What was High Anxiety [misnaming High Energy]? Arthur: [laughs frenzied and nervously] That never happened! There is no High Anxiety! [laughs] It's an old Mel Brooks movie! [laughter] Honestly, I met some guy-can't even remember his name now, it's been so long-at a convention, and he was putting together a comic book magazine, and he saw some of my stuff and asked me to put something together, and I put together something I hope will never, ever see print! Ever! [laughter] It was pretty bad. CBA: Was it super-heroes, science-fiction...? Arthur: [Sobbing] It was horror, as I recall... please stop. I'll give you money. CBA: [laughs, after accepting a large sum of cash] Thanks. We'll move on, now! Was that your first published work? CBA: Ten whole dollars, your first professional sale! Did you get stuff published in fanzines at all? Arthur: No, I was not even aware of fanzines. They weren't around much at that time. Amazing Heroes might've been being published around then, and I'd occasionally pick up those. CBA: Did you have any art education? Arthur: No, I just sat around drawing all the time! [laughs] I had a couple of good teachers in high school that mostly told me not to draw super-heroes. [laughs] When I was a freshman, there was a teacher who was teaching newspaper strip kind of storytelling, so I did one or two of those, and he just stressed how important it was to be clear in storytelling, and that's always stuck in me. Mr. Vandenberg, as I recall. CBA: What did your parents think about you drawing? Arthur: "This is not what we had in mind, son!" My grades in high school when I got in were pretty good, but by my senior year, I just didn't care anymore. They were sure I was never going to move out. CBA: [laughs] Was there any thought for you going to college? Arthur: Not really, no, I was desperate to become a professional comic book artist, and I guess I was young enough to be arrogant enough to think I didn't need to go to school, I'd just got myself a couple of "how to draw the human figure" books, and I thought that was enough! I guess I was right! [laughs] It seems to have worked out okay. I was looking at all those various people I was talking about were comic book artists, all big influences as well, and I think that showed for a long time. It probably still does, to some degree. CBA: Did you get support from people you showed your work to? Did they spark into it and say, "Hey, this kid's got something!"? Arthur: Yeah, some did, which is funny because, looking back on some of that very early stuff, it was god-awful! [laughs] But yeah, I'd hang out a little bit with Mignola early on, before he started as a professional inker. CBA: Where did you guys meet up? Arthur: Oh, we met at a Creation Convention in San Francisco. We were both showing our artwork to some guy, and he was horrified that I was inking with a Croquille. Mignola might've been inking with a Croquille, too, so I went home and thought, "Oh, I'd better learn how to ink with a brush." Actually, that was good advice. Somehow, in getting control of the brush, I actually got to be a much better artist all the way around! Much better with the pencil and the Croquille, which I eventually went back to inking with. Arthur: Maybe a year or so after. I was mostly interested in penciling anyway, I didn't spend that much time trying to ink, as I recall. CBA: You're renowned as a really tight penciler, right? Arthur: Well, that's what people say! That's what I hear. Yeah, I don't trust inkers. [laughter] I don't even like them! They're terrible people... [laughter] No, no, I've been terribly lucky, I've had very good inkers. But I guess I'm kind of a control freak when it comes to my art, I want it to look "just so." So yeah, my pencils have tended to be pretty tight. They're not so tight when I'm inking myself. A pastiche of Carmine Infantino's memorable '60s Caped Crusader cover featuring Batman holding up a wired Gorilla Grodd (who was-holy heavyweight!-timed to explode if the ape touches the ground), Arthur Adams drew this unused Impulse cover. ©2002 DC Comics. CBA: Which is the majority of your work nowadays? Arthur: Well, I prefer to ink myself, because as lucky as I think I've been with inkers, still somehow, it's never looked quite right to me, mostly because when I do it myself, I'll just change things as I'm inking it, or add a little more shading or rendering. Once the inker has it, it's out of my hands, and no matter how much I beg my editor to send it back to me, [laughter] editors just don't think that's a good idea! So yeah, I prefer to ink my own stuff. Right now I'm inking "Jonni Future" for Tom Strong's Terrific Tales, but I'm still working-as of this moment-on The Authority, and that's being inked by Tim Townsend, who's doing a great job. CBA: Could you name a handful of favorite inkers? Arthur: Sure! Of course, I was very fortunate to have Terry ink a couple of things early on, and that was great. I really like the way Bob Wiacek inked me on some X-Men Annual. CBA: Who inked you on Fantastic Four? Arthur: That was Art Thibert, who inked all of the first issue, and I think most of the second. Al Milgrom inked the third one, and I think Al did a great job on that desperately late issue. Walt [Simonson, the writer] said he needed a breather, so he got me to pencil three issues. Not only did he need a breather, he needed to get a little bit ahead on the issues, so he wrote three for me, and I think during the whole time I was working on those three, he didn't do any work on his own stuff, so he didn't get anywhere! [laughter] That was a fun series... See, I have a reputation for being slow, so I remember the few times that I'm not! [laughter] I think the first issue I ended up taking five weeks, a week longer than it should've been, but I did my best. [laughter] I think the second issue-of course, it was getting later-took about four weeks, and then the third issue, I think it was so desperately late, I think Ralph Macchio was calling me several times a day, saying, "Please send out pages today!" I think I ended up doing that one in three weeks! That's unbelievable! For me, anyway. CBA: [laughs] I heard that story earlier this morning. One of his old assistants, George Khoury, said, "Ask Art about that last issue!" Arthur: Oh, yeah, that was a rough one! I think I actually ended up inking two pages at the last minute, because it just had to be done! I penciled those two pages the day before, inked both of them and mailed them off. I was very impressed with myself! [laughter] I was finally a real comic book artist! Then I think I took the next three months off. CBA: [laughs] What can you produce in a day? Arthur: I can apparently produce two pages in a day, but I have to be in some weird state of panic. [laughter] As a general rule, I tend to do 2/3 to 3/4 of a page a day. Arthur: About the same. Really, that's one of the weird things about me, it's always depended on the deadline. If I have a lot of time, I'll take a lot of time. If I don't have a lot of time, I won't! I did have one cover for Scott Dunbier [Wildstorm/ ABC editor], I don't think it came out particularly well, but it came out okay. It was a blank page at eight o'clock in the morning, and at four in the afternoon, it was completely done, penciled and inked. It can be done! CBA: Do you color at all? Arthur: No. I've toyed with painting at various times, just watercolor, nothing fancy. I'll try it once every couple of years, and then, because I haven't done it in such a long time, I always have to relearn whatever I've forgotten, [laughs] and then I'm not generally happy with the results, and don't have a chance to do it again for quite a long time. I'd like to find more time to do stuff like that. We talked earlier a little bit about my trying to paint Frazetta drawings, like oil paintings. I eventually did get some oil paints, and that was a lot of fun, I would like to experiment with that again. CBA: In a perfect world, would you like to go to art school? CBA: Early on, did you seek out professional advice? Arthur: Definitely. I have only got one comic book signed ever-some issue of Spider-Woman-by Steve Leialoha and Chris Claremont, who were at that same Creation Convention where I first met Mignola. I just got it signed because I wanted to ask them how to get into comics. They gave me the standard answer, and that was fine. CBA: So how did you go about getting into comics? Arthur: [laughs] Actually, this is pretty weird! At one of the early Creation Conventions, I met Joe Rubinstein, who said, "Let me take some of your samples to Denny O'Neil and Linda Grant." They were at Marvel at the time, maybe editing Daredevil at the time. They were doing a black-&-white book called Bizarre Adventures, of which they only did three or four issues. They said, "Do you want to do a short story for this?" I said, "Sure, why not? I'll come up with something." So I wrote a three-, maybe four-page story, and I did thumbnails of it, so I had the complete script with thumbnails, and I sent that in, and they said, "Oh, this is great, this is funny, who would you like to draw it?" [laughter] I said, "You don't understand, I want to draw it!" They said, "Okay, give it a go!" So I penciled it, sent it in, Joe inked it, and I was so excited, "Wow, I got my firstlittle short story done!" I called up Grant, and asked, "So, do you have anything else for me now?" She said, "We'll call you." [laughter] Thank God, that book was cancelled, and that story was never printed. It was some really odd thing about some middle-aged guy whose life has gone horribly wrong, and decided some high school teacher had ruined his life. So he went back to school to kill his teacher, at this point an old lady, and she whips out this giant machine gun and blows him away, and says, "Do you remember that apple you gave me? It was sour!" [laughter] So I'm not really sorry that wasn't published! CBA: At the time, you must've been disappointed. Arthur: I was, but I got the impression nothing more was coming, so I did yet again more samples. I was working at Round Table Pizza at the time, so I did a short story of the She-Hulk and Spider-Woman going to Round Table Pizza. [laughter] There's a monster at Round Table Pizza. So I sent that to everyone, because at this point, I think DC Comics had a submissions editor, but Marvel did not, so I just sent copies of everything to every editor whose name I could find at Marvel. CBA: Did the fanboy within cry out, "All I want to do is Fantastic Four"? Did you have a goal? Arthur: I just wanted to draw comic books. I didn't care what I drew. I figured I was going to end up drawing G.I. Joe, at that time my least favorite comic book. CBA: But you were willing to do it? Arthur: I just wanted to be a professional comic book artist. After I decided that was what I wanted to do, that's all I ever wanted to do. So, I sent these samples to everyone at Marvel, and apparently Al Milgrom at that point was just beginning to go freelance, so he had a big pile of Xeroxes, and Carl Potts was moving into his office, and so Al was just going through this pile and tossing ones he thought might have some potential over to Carl! So I got a call a couple of days after that from Carl or Ann Nocenti, who was Carl's assistant at the time. They thought my samples might have some potential, so they sent me a script they wanted me to take a pass at (that was already being made into a finished story by another artist). I did thumbnails, sent those in, and they seemed to like my work okay, but then the real comic book came out, and I thought, "Wow, mine's actually better than that! Mine's actually funnier!" CBA: Was it a super-hero story? Arthur: Yeah, it was. I don't want to say who did the printed story. It was a script for a regular Marvel series at the time. So they liked my samples, and then they asked if I was interested in drawing Longshot. I said, "Sure!" CBA: How did they describe Longshot? Arthur: [laughs] It's been a long time, I don't remember there was that much description on the phone. I think she sent me the description, after she said she'd asked absolutely every artist involved with comics at the time to draw it, and absolutely everyone else said no. Carl had done some character designs on Longshot. Do you remember in Star Trek: The Motion Picture, the blue suits they wore that looked kind of like footie pajamas? He drew Longshot like that, with curly blonde hair with a black streak in it. Somehow, Longshot also had a tattoo on his eye when he was using whatever the heck his stupid power was, and that didn't make any sense to me whatsoever. [laughter] I just started doing my own drawings. I think I did five or six different drawings of Longshot, and then I did 20 alien creatures. It was a lot of fun! CBA: The general look of the character, was there an influence from Michael Jackson with the costume? Arthur: I don't think so. This was actually the early days of MTV, 20 years ago, and there was a group called Kaja Googoo, and I saw the lead singer and said, "Oh, that's weird hair! I don't see anyone in comics with that kind of hair, I can use that for Longshot!" I'm not sure where the rest of the costume was from, I was just trying to make it look different than other costumes that I was aware of. CBA: Did you have a specific schedule for Longshot? Arthur: Thank God, no, I didn't. Louise Simonson was the editor on that-which was weird, because as we were just getting started, she decided to just freelance edit the rest of the book, which was great for us. We didn't really have much of a schedule, no, and I ended up taking eight months for the first issue! I don't even know why it took that long, I just wanted it to be just so. I think I actually redrew the first half of the book. The way Ann writes, she just packs a ton of story in those few pages, so I was sending in layouts for pages with 20 panels on them, and Louise wisely said, "Maybe this isn't such a good idea." So I redid the first half. I had all kinds of problems with perspective, because I'd always drawn just guys running around and fighting, and hadn't really bothered to learn how to draw buildings, things like that. In that first issue, I had to draw a town, and there's a windmill there. Oh, my gosh, a windmill! There's all kinds of perspective on that! So I had to draw that, and there was a baby in it, and it had never even occurred to me previously to draw a baby! Yeah, that first one ended up taking about eight months. Ye Ed found Arthur Adams' rendering on the comics adaptation of the Universal monster flick, The Creature from the Black Lagoon, to be a revelation and in our humble opinion, Arthur's best work to date (well, before "Jonni Future," anyway!). Bravo, Mr. A! Courtesy of inker (and the recipient of this issue's dedication), CBA's Main Man, Terry Austin. ©2002 Universal Pictures Company. CBA: Were you still working at the pizza joint? CBA: Did you have a job? Arthur: At Round Table Pizza, after a while, I started having nightmares about pizza, and I thought that was a good sign to stop working there and just work on comics. I'll tell you, I was fortunate that my mom and dad let me stay home and work on that stuff, to do more samples. So I finally did get some work. CBA: Oh, you slacker, you! Arthur: Yeah, I was pretty bad. [laughter] Let's see, I think it took eight months for that first issue. What could I have been doing? CBA: Did you see your style progressing during that eight months? Could that have been a part of it, too, of redoing the first half of the book? Arthur: Well, that was certainly why I redid the cover a year later! [laughs] It just didn't look good, my drawing had definitely improved, as I think anyone's would, if you're not used to drawing all the time, like over eight months-I could've been drawing all the time, I think I was! [laughs]-after that, I did the Pacific Comics Alien Worlds 3-D Special, so I did one little short story in there. CBA: Did you luck out getting Weezie Jones as your first editor? CBA: Were the plots Ann gave you particularly dense? Arthur: Oh, yeah, definitely. That's why there are some pages in there that are just cram-packed! Almost every issue is a couple of pages longer than it should've been. I kept asking, "Please, let me have one more page. We need this! Can we have one or two more pages?" We were really lucky. I don't know how many mini-series had been done at that point, there weren't that many, but I think Marvel was just very flexible on that particular book at that time. I'm not even really sure why, I don't know whether we were getting any attention from Jim Shooter, because I wasn't really aware of him at that time! I'd met Jim once at a convention. Louise had introduced me to him at, I think, my first San Diego convention, and he was very helpful. She made him sit me down, and he got this old, tattered Marvel comic-I can't even remember what it was, I think it was an old Kirby Captain America comic-and he just gave me a really quick, "This is how to draw comics... this panel introduces the character, this is a... just try to make the storytelling as clear as possible," and it was really, very helpful! That was pretty much my only interaction with Shooter! I was never in New York, I was in California this whole time. CBA: Did you remain in California? Arthur: Yeah, I was in California for ages. I finally moved away from home, moved to Oakland, moved to the same apartment building where Mignola and one of our friends, Steve Purcell, was living. We weren't sharing an apartment, just in the same apartment building. CBA: Were you close with Mike? Arthur: Yeah, it's funny... I sometimes think of Mike as an older, meaner brother. [laughter] Which is kind of strange, since I only have little brothers, I never had an older brother. I hope my brothers don't read this, [laughs] but I was just always closer to Mike than my own family, because my family's not interested in the same things I'm interested in. CBA: Have you ever inked anybody else's work? Arthur: Very little, not too much. I inked a Don Heck thing, a "Mister Miracle" for... I can't remember what the name of that book was [Secret Origins]. It was a really odd job. I think Mike Carlin was the editor on it. It was a really odd job, it was from two different characters' points of view, so the top half of the page and the bottom half of the page was the same pencil drawing, even though Don Heck drew it twice-it wasn't like a lightbox, it was actually drawn twice, the same thing-but it was written from two different points of view, so the top half of the page, as I recall, was inked by Klaus Janson, and I inked the bottom half. It was a really peculiar job. But it was weird, sort of fun. CBA: Did they offer the job to you? Arthur: Sure, sure. I inked an issue of Superboy, of all things. Who did I ink on that? I think it might've been Jim Mooney! That was really odd! CBA: [laughs] That was your limited experience inking others? Arthur: Oh, I've done some bits of stuff. I was supposed to ink an issue of Ghost Rider for [editor] Bobbie Chase over one of the Kubert brothers, and they sent me a bunch of pages, and I don't remember anyone giving me a deadline, so I was just putzing away at it, until finally somebody said, "Hey, the whole issue is due tomorrow!" "Well, I've inked five pages!! Why didn't someone tell me that?" [laughter] I ended up having to send that one back. I inked a handful of those pages, and I liked the way those came out. Not too long ago, I inked over my wife, Joyce's pencils. She'd done a couple of pages for Dan Brerton. That was fun. CBA: At the time, when you came to the fore, people could argue that 1986 was just about the best year in comics. From one side, there came out The Dark Knight Returns and Watchmen, but there was also Love and Rockets and Maus coming out, some real solid alternative material, and it just seemed almost limitless where comics could go. Of course, it came crashing down in '87, but for a moment there... Did you have aspirations of not going the Marvel route at all? Seeking out your own way? CBA: Were you ever particularly political? CBA: Do you see issues within the comics field that perhaps you should address more? CBA: Do you feel that, perhaps, the difference is there's an injection of humanity within your work? Arthur: No, no, no, no! [laughter] It's just that people are going to look at this and go, "Oh my God, what happened?!?" [laughter] There's millions of these moth-women invading the solar system eating everything, so Jonni tricks them by igniting this magnesium asteroid, so it's burning brightly, so all the moth-women are attracted to it, and of course, they all die horribly! [laughter] They all fall into it, and they're exploding, and there's flames everywhere... I'm thinking, "This is grisly!" [laughter] But oh, well... ! It's written by Steve and Alan Moore, so it's genius, pure genius! Arthur's pencils to his delightful "Li'l Danger Girl" story, "Delusions of Grandeur," from the Danger Girl Special Edition. Okay, so it's cheesecake. But it's really cute cheesecake! Danger Girl ™ & © 2002 J. Scott Campbell. CBA: I read a Comics Interview featuring you, in which you said that because of your experience with Ann's dense scripts, you weren't particularly interested in collaborating with Alan Moore. Arthur: You tracked down that Comics Interview, huh? I was hoping I didn't leave enough of a trail, so I could just be mysterious at all times! [laughter] Yeah, I was really worried about working from a full script. I liked the freedom of being able to set my own pacing from just a plot and suggesting dialogue, which I would often do. So I wasn't crazy about the idea of a full script, but I figured, hey, give it a try, and you know, it's been a lot of fun! It's been a surprising lot of fun, and both Alan and Steve constantly makes it clear that I'm welcome to change things wherever I think might be appropriate. CBA: Are Alan's scripts, as legend has it, very dense? Arthur: They can be, but not overly so. Early on, they just set the tone, there's quite a bit of description, but not too bad. Not nearly as much as I feared. The Authority has been all full-script. I think of "Jonni Future" as being Steve and Alan's book, really. Only partly mine, because I designed it. But The Authority, I really think of that as being solely Mark Millar's book, and sometimes, if he asks for something I might not think would be a great idea, I'll try to find some way to do it the way he suggests. Sometimes it doesn't work, and I go with what I think would be better, but I've really enjoyed working from a full script, both on the Mark Millar stuff and on the Steve and Alan Moore stuff. CBA: On The Authority, did you always have in mind this would be a temporary stint? Arthur: It was only going to be three issues... and it still is only three issues! And maybe not even that! [laughs] There's just been problems throughout the whole thing. CBA: Isn't the content you're talking about post-September 11? Arthur: Mark has been ill, and there've been some illnesses with some people around here. It's just been a rough year, terrible for some reason for getting that book out. It's coming along, and I'm really happy with it. I liked it better before it was toned down, but you know, we felt we had to lighten up on the violence. In the first issue, it was made clear that George Bush-while not necessarily being a bad guy-was certainly one of the pawns of the bad guys, and then in the third issue, Bush was going to be treated very unkindly, and that's not that popular right now, and that's okay, because I don't know Bush personally, so I felt a little bit bad about making him a bad guy. He might be a bad guy, but I don't know! Arthur: Oh, no, not now! CBA: Do you think Alan Moore is generous with co-creator credit in his ABC titles? Arthur: Oh, absolutely. He's had a hand in the creation of Jonni Future, but on the little "created by" credit it says "Steve Moore and Arthur Adams." So, yeah, he's very generous, and a really smart guy. I really like those ABC Comics! I was actually asked to do one of those earlier on, and I said, "I don't think I'd enjoy doing that right now, but thanks for asking." But the things started coming out, and those are great. CBA: You drew a Tom Strong story. Arthur: Right, around #4, after I realized my mistake! CBA: Do you have a piece of the action, so to speak? Do you own the Nazi villainess you visually created in that issue? CBA: For instance, when Eastman and Laird were doing Teenage Mutant Ninja Turtles, they would feature characters created by others like Steve Bissette's X-Dimension turtle... the Panda Khan action figure would have its creator's trademark on the package, for instance. I was wondering, how far can it go with ABC? Arthur: It just depends on the people involved. I'm not too sure how Wildstorm would be with that, now that DC is involved, but in the past, certainly, if I'd come in and said I want to try out a character, could he visit one of your characters, I don't think there would've been a problem with that. I'd think that's true with ABC Comics, whether there's a problem because of whatever involvement DC might have, I don't know. CBA: Getting back to the chronology, did Longshot come out on schedule? Arthur: As I recall, yes, because they were all the way done! CBA: Was the plan to have a double-sized last issue? Arthur: From the very beginning? No. But I asked if we could expand the last issue, because I thought it would be nice, and because there's a lot of story in it. CBA: Did you feel you were getting some impact within the industry? Did you receive notice from peers? CBA: Were the sales on Longshot good? Arthur: Nowadays, it would be unbelievable. I think the first issue was a little over 100,000-which at the time was, I think, slightly above average, it wasn't anything people were going nuts about. I think the last issue went down to 70,000 or 80,000, but now that I think about it, the cover price was probably higher, so that's probably not that bad a thing. The sales on it were okay. They weren't stellar, but they were okay. CBA: Did you get royalties from it? Arthur: Yes. They weren't huge, because it was one of their regular books, and there were a little bit of creator royalties. CBA: Was it the equivalent of a month's income, or less? Arthur: More like a half-month's income. It was like $1,000, something like that. Some of the royalty checks, as I recall, were around $600, most around $1,000. The one Marvel book that actually made a ton of royalties for me was the Excalibur special I did, which surprisingly enough, is the book I hate the most that I've done! Excalibur Mojo Mayhem, they called it. It's baby X-Men who were on Longshot's planet who get away from Mojo and come to Earth and meet Excalibur. At this point in the series, everyone thinks the X-Men are dead, so Kitty's like, "Oh, my God, it's the X-Men, but they're babies!" [laughter] Very peculiar. It was one of those when I didn't have a good time with the editor, because the deadline kept changing. That one has the page I drew the fastest. In half an hour! CBA: And you made the highest royalties on that book? Arthur: Yeah, I got a lot... Yeah, tens of thousands out of that one. Arthur: Yeah, it was really wild. Arthur: Well, I guess it got done fast enough! Arthur: I did an Annual every year, or every other year for a while. Arthur's pencils of a page of his second "Jonni Future" story, "Moth-Women of Myriad Moons," featuring some outrageously-shaped aliens! Her anthropomorphic companion is Jermaal Pan Pavane, the Para-Man! ©2002 America's Best Comics, LLC. CBA: I do recall you doing a pastiche of Kirby's Journey into Mystery #83, the first Thor, for a cover. Arthur: Yeah, for the X-Men Annual #9. CBA: Around the same time Jack was having a hard time with Marvel about getting his art back. Did you have any feelings about that controversy at the time? CBA: Three-quarters of a million! Arthur: Yeah, I love Doctor Strange, but I don't think Marvel's ever done that well with it. I wouldn't want to say anything bad about Doctor Strange for all of his fans out there! CBA: It was obviously a big issue at the time. Arthur: You know, I honestly don't remember that much about it. CBA: Did you go to the San Diego conventions? Arthur: I would go to San Diego every once in a while, but I never met Mr. Kirby. CBA: You never got a chance to? Arthur: I saw him, but I've always been shy around the artists I admired. I regret now that I had not talked to Gil Kane. I wish I'd spent some time talking to him. We actually shared the same birthday, April 5th. CBA: Did Kirby increasingly become an influence as you were working professionally? Arthur: Oh, definitely. Even more so after I became a professional. There was that early issue with the Avengers, Fantastic Four and the Hulk, and I loved that like crazy, and there was a bunch of Kirby stuff I loved, but I wasn't necessarily aware it was Kirby. But when I was trying to draw better, Kirby's stuff wasn't more of an influence, actually. I don't think this is that unusual amongst young artists, but I actually thought Kirby's style was ugly. You know, a lot of the faces would just be ugly, and I just couldn't see beyond that. But certainly, as I became a professional, I became more and more aware of the value of the Kirby stuff. CBA: I wonder if there's a parallel there with you and Mignola. Kirby certainly seemed to become a bigger influence as he became a professional. Today, Mike's style is almost a weird amalgamation of Kirby and Toth.